We are delighted to welcome the robinson +co team as one of our Corporate Supporters for 2019. 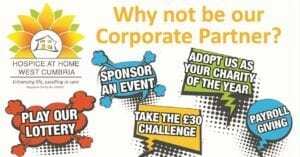 At the beginning of each year, the team at robinson+co Chartered Accountants and Business Advisers get the opportunity to nominate a charity they would like the firm to support for the year. Philip Allison, Practice Manger for robinson+co added ‘We have offices throughout West Cumbria – Workington, Whitehaven and Gosforth and it is great to see all the money raised and the hard work done by Hospice at Home West Cumbria benefits and stays in our community’. 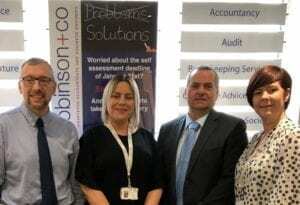 Hayley McKay, Head of Marketing & Income Generation for Hospice at Home West Cumbria said “We are really delighted to welcome robinson + co as one of our corporate sponsors, it’s brilliant to hear the staff chose us, thank you. We look forward to getting to know them all and working with them throughout the year.